These tilapia are sure to be a hit with your family, and they're just part of this complete dinner. The moist, large flakes are melt-in-your-mouth tender and each fillet is lightly glazed with lemon-garlic butter and perfectly fire-roasted before they're frozen for impressive no-effort results. The meal is completed with healthful and colorful 5-grain rice pilaf and cut vegetable side dishes for four. 1 (1.5 lb.) pkg.� |� ~6 pieces. Do Not Thaw! Microwave: Place one frozen fillet on a microwave safe plate, fire roasted side up, cover with plastic wrap venting one corner. Microwave on high heat for 2-� to 3 minutes. Let rest 1 minute before carefully removing plastic and serving. Oven: Preheat oven to 400�F. 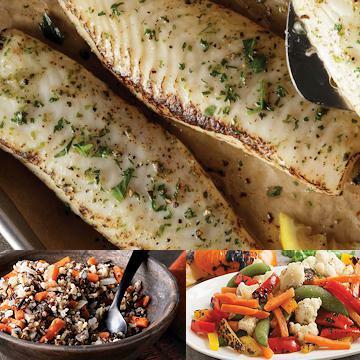 Place frozen tilapia fillets, fire roasted side up on a baking sheet lined with foil or parchment paper. Bake for 18-20 minutes.